Will a cracked beak heal itself? The following is a collection of recommendations and inputs, bird owners, breeders and some vets ... Please discuss applicability to your own pet's health problem. The Avianweb will not accept liability for anyone's failure to consult with a vet. Please refer to disclaimer. A cracked beak is like a broken tooth and as bone and nerve endings are connected to the beak, such injuries are painful. The beak has an abundant blood supply, so any beak injury is likely to cause excessive bleeding. With a puncture, fracture or amputated beak you will need to apply pressure to stop the bleeding. You need to contact an emergency clinic or your avian vet as soon as possible -- but do not wait longer than 24 hours! A cracked beak won't grow together, but will grow out over time. 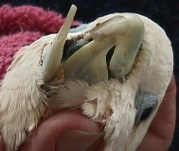 Amputated or torn off beaks, as well as fractured beaks, will not grow back, but can be repaired. Course of action depends on the type of bird and degrees of severity of the injury. A vet visit is recommended. One web visitor recommended: "If it's small and doesn't seem to bother your bird and doesn't bleed, leave it alone and it will simply grow out like a chipped fingernail. One suggestion was to superglue a broken beak, however, most glues are toxic. This is not generally recommended. However, super glue gel has been used on numerous occasions. Super glue GEL runs less than regular super glue - so is preferred. Only little of it should ever be used because of fumes; and special care should be taken that none of it runs into the eyes, nostriles or mouth. Make sure you have some cuttlebones, calcium / mineral blocks or pedicure perches for your bird to rub on. So it can naturally trim its beak. The risks of a cracked beak may involve possible infection or the bird's disability to eat properly. If cracked a little higher or deeper, your pet may be gushing drops of blood from the beak tip. In many ways this is another case of high blood pressure making the bleeding worse. But a deeply split beak may cause a bird to bleed to death. It is not the pain, but the unstoppable bleeding that you must concern yourself with. The end of the beak can be "corked" or plugged using a mass of softened soap. Scrape this from the underside of a bar of soap from the bathroom. This technique can also be used as first aid for a bleeding nail. This is considered an emergency and your pet should immediately be taken to a vet. If the beak is torn off or the outer layers are damaged, the underlying tissues may begin to dry out. The wound can be rinsed with sterile saline (preservative-free contact lens solution is perfect for situations such as this) to flush out any debris and to help keep the tissue moist until your bird can be evaluated by your veterinarian. Do not be aggressive with flushing, and do not remove the beak if it is partially attached. Your vet may your bird's beak or wire it together, and covering the injury with a beak composite cast until il regrows. At the hospital, the bird may need to be fed with a feeding tube and, while the beak grows back, your bird will need soft or moistened food. With a minor beak injury, supportive care, appropriate antimicrobials and pain medication and time to heal may be all that is necessary until the defect grows out. With larger injuries, light cured composites or dental acrylic can be used to patch the area until the beak grows back. A fracture to the beak can be repaired, if the blood supply is still good. Some beak injuries result in permanent, disfiguring damage, requiring the bird to eat soft foods for the rest of its life, but other injuries may heal quite well allowing the bird to return to normal beak functioning. One case I have followed of a Bald Eagle whose upper beak was torn off was resolved by a dentist, who made a dental impression of a healthy beak, reproduced the beak with the same materials used for our teeth -- and he successfully attached the beak -- allowing the Bald Eagle to function normally. I have also heard of beaks being repaired / rebuild with acrylics ... the same material used for artifical nails. Minor beak injuries may heal well after they have been cleaned. Large or deep beak wounds can be cleaned and patched with acrylic. The patch not only protects the wound from infection but also adds stability. Birds with severe beak injury may require supportive care with fluids and tube feeding, and the administration of antibiotics and antifungals. The horny beak or bill (rhamphotheca) is a hard, tough, keratinised epidermal structure in birds of prey, as well as seed and grass eaters. In waterfowl such as ducks, geese and swans (Anatidae) the beak is much thinner and softer The rhamphotheca is a modified horny layer consisting of layers of flattened keratin-filled cells, separated from the bones of the upper and lower jaws by a thin, fibrous dermis. The beak's strength is dependent on the particular arrangement conferred by a layer of keratin on a firm bed of bone. The beak will heal by a process of granulation and epithelialisation, much as with any other epidermal tissue. However, there are practical problems in that the beak will be regularly immersed under water and into food bowls. The objective of any wound management plan should be to keep the wound clean and moist to facilitate the spread of granulation tissue over the exposed bone and protect the bone from dessication. The use of a waterproof dressing is indicated. Products such as the protective paste (Orabase) are resistant to water and can be used to pack the wound cavity. Hydrocolloid dressings can then be applied over the wound to provide further protection. Broad-spectrum antibiotics are indicated until a healthy bed of granulation tissue is established. The rhamphotheca has a good blood supply and will heal well. This can be relied upon when performing surgery on the upper beak. Zupreem monkey chow has been well received by bird, and is a good choice. Please note the below for a good quality diet for your injured bird. Harrison's is known for their high-quality feed.